Speedy delivery and excellent product. The chains once you do a run through are easy and quick to put on. Had to use them already. Allows me to go places I would not take a chance normally. Chains arrived quickly as promised. They were easy to install although I had a bit of a fit problem Canadian Chains took care of it promptly. Outstanding customer service, I would deal with this company again with no reservations. 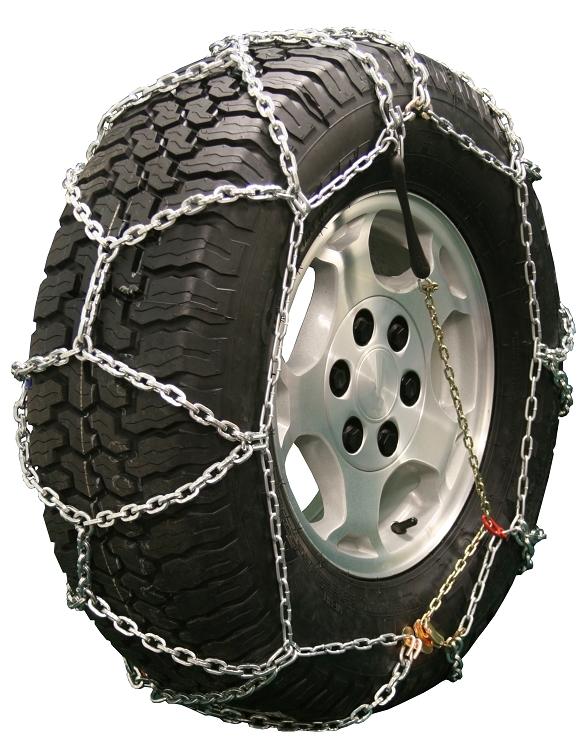 These chains are very effective for snow and ice on personal use trucks. They are relatively easy to install and adjust. Always a good idea to dry-fit them before you head off road. Not too "deep" inside the tire as many others are and clearance between the tire and control arms is sufficient. Many heavier ladder style chains simply don't fit without using axle spacers. These work just fine. Good value and delivery was fast and efficient. The chains arrived promptly, are in a nice case, and of a seemingly good quality material. HOWEVER, the instructions which talk about colour coded chains and latches are wrong for what was shipped. More seriously than that is that the chain that is supposed to loop thru the red Circular link then across the outside of the wheel to prevent the chains from working loose from the tire is way, way too short and not at all like what is shown in the online images. I only had to put them on to go down my steep icy driveway for the first time this weekend, i would not drive them on the road as i would be worried about the chains working themselves off the tires. I hope the company offers me a solution quickly. As a snow plow operator in a rural area I often come across icy back roads with steep inclines. Tire chains are a must unless you want to ditch your truck or worse. I usually will only put them on the front tires for steering and braking, however after a significant ice rain I will chain up all 4 tires. I like these chains alot, easy on and off, heavy enough for my application,and reasonably priced. Make sure you size properly because they will stretch with usage over time. Received chains very quickly. They seem sturdy. Wasn't happy about having to use Class S chains on the new F-150, had hoped to use a set of chain chains I had on hand, but these look like they'll do the job. Was happy to see they had the square chain cross links. Easy to put on, don't have to crawl under the truck to put on, but likely have to to take off. The take-up chain on the outside links is too long for the bungee to pull tension with the current tires but will likely be just right with proper snow/mud tires having side lugs. Easy enough to bend the hook and shorten the chain however... Not a problem. Happy with order, service, shipping and chains. Well done. Chains are good, but the instructions that came with them are not correct. Instructions are for similar model, but with differnet links. Could not figure out how to put them on. Left me standed. Totally unsafe and very unhappy with my purchase. Really great service and fast delivery. The chains fit well and seem to be good quality. GREAT CHAINS,GREAT SERVICE AND FAST SHIPPING. I WOULD ORDER AGAIN. Bought the Hesse chains for highway mountain driving. Trial fit test was easy. A very effective, stable chain that's set up well. 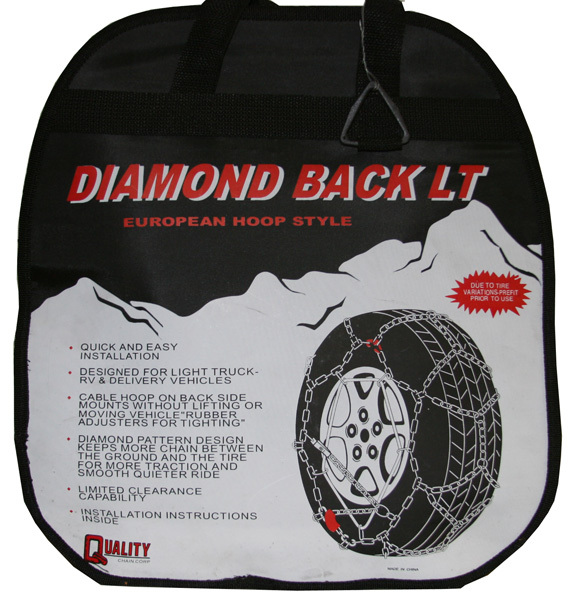 Relatively quick to put on, and excellent for tight inner tire-to-suspension clearances because of the inside cable. Have used them on spring ice and deep ditch snow with great results (F150).